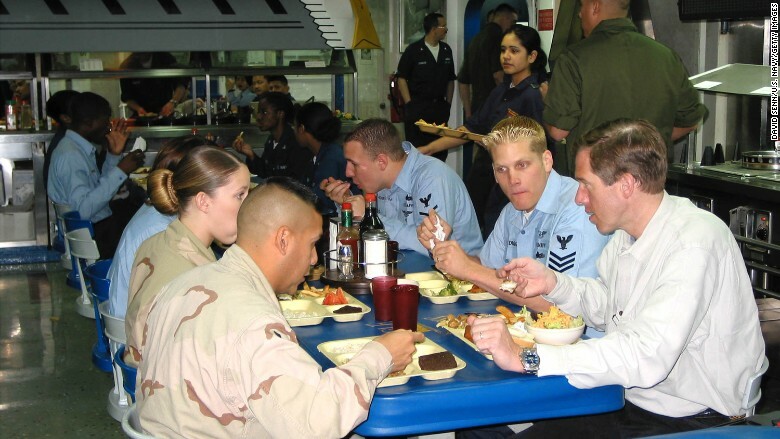 Brian Williams, seen here dining with Sailors and Marines aboard the USS Tarawa in 2003, is taking heat from war reporters for his inaccurate account of a helicopter mission in Iraq. There's been one recurring question since Brian Williams' admission on Wednesday that he wasn't aboard a U.S. military helicopter that was struck by a rocket-propelled grenade: Just how does someone forget that? The "NBC Nightly News" anchor insists his erroneous account of a 2003 mission in Iraq was merely a mistake, but he's facing a skeptical audience of journalists who have also reported from the theater of war. Michael Lev, who did multiple reporting stints in Afghanistan and Pakistan after 9/11 and now sits on the Chicago Tribune editorial board, is wondering the same thing. "Being shot at in a helicopter? How do you mix up whether that was your experience or someone else's?" Lev said. Williams' pilot said that his helicopter did, in fact, draw small arms fire that day in 2003, lending support to some of the anchor's previous claims. But Williams has also repeatedly said that his helicopter was struck by an RPG. In fact, it was a different helicopter involved in the mission. "I remember every serious car accident I've been in, and I'm not at all confused about which times I totaled a car, and which times it was one of my kids," Lev said. Carlotta Gall, the North Africa correspondent for the New York Times who's previously covered wars in Afghanistan and Kosovo, echoes that sentiment. "You don't make a mistake on that," Gall said. "I think there are things that you misremember, and I think we as journalists are very aware of that. I know that I've sometimes gotten things wrong that I've witnessed. But I think in this case he's sort of truncating the story and making it more dramatic, which is, of course, not permissible and not forgivable. It's really unfortunate. It's unfortunate for the profession." Williams has been pilloried from all corners, with some of the toughest criticism coming from journalists who have been involved in the very situation he mischaracterized. The particularly negative reaction from these journalists likely stems from the inherent danger of covering combat. "As someone who spent several months in southern Afghanistan covering the U.S. infantry, walking foot patrols and occasionally coming under fire, I cringed when I saw the story about Williams," the Washington Post's national security writer Dan Lamothe wrote. But some war journalists were uneasy about discussing a colleague's transgressions. One correspondent who covers Afghanistan and Pakistan for a major news organization said she "won't comment on other correspondent's (sic) work or behaviour." A prominent photographer who's spent extensive time in war zones said simply, "I think I'm going to stay clear of this one." A veteran foreign correspondent for a major newspaper agreed to weigh-in if her name wasn't used. She said she was "a little less condemning" of Williams than others, but that doesn't mean she finds his explanation believable. "He's talking about a mistake, but it doesn't sound like a mistake. It sounds like selective memory. You have to own up to those things," the correspondent said.